Mohamed El Kantaoui was brought into this world in Tafilalet, Morocco and is a Quran reciter of huge stature and indisputable repute. Sheikh Mohamed El Kantaoui graduated in the discipline of Quran Tajweed and Al Iqra, supervised by Sheikh Safa Al Aadmi in Baghdad was given a certificate of appreciation by noteworthy Shaykhs like Sheikh Qutaibah Al Hajj Al Saadi, Sheikh Omar Zaki Faraj, and Sheikh Alaa Eddin Al Qaisi. 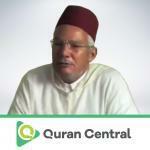 Sheikh Mohamed El Kantaoui saw the seeds of his labor grow successfully with him officially lending his voice to the Moroccan version of the ‘Hassani Quran’ which was overseen by the Ministry of Awqaf and Islamic Affairs in 1989. Sheikh El Kantaoui has always been an integral and inevitable pillar of the Moroccan royal family which has been exhibited at different occasions prominent among which are judging for Mohammed VI Award for the Holy Quran Tajweed and memorization, initiated by King Hassan II and being selected for conducting the “Taslima Tain” till the death of the King and not to forget being anointed to grant Quran learning to the grandchildren of the late King Hassan II which was continued even with King Mohammed VI of Morocco.